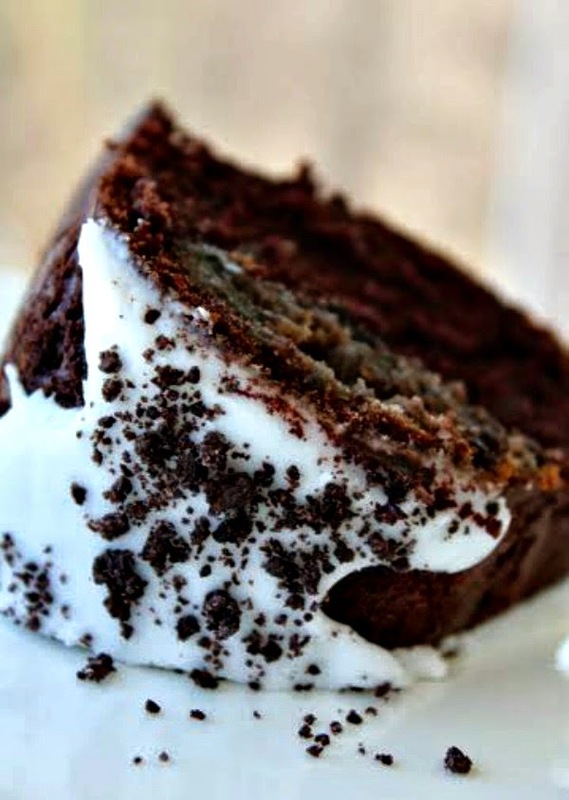 If you love chocolate and oreos you are going to love this cake. I made this for a friend's birthday, because oreos are her favorite thing ever. Everyone loved it. The filling really makes this cake and it is a surprise until you cut into the cake. Using a box cake mix makes this super easy and saves time, but you can use your favorite homemade chocolate cake recipe too. 1. Put 12 oreos in a ziplock bag and crush. You want the cookies to be broken into small pieces but you do not want to crush them too fine. You want small cookie crumbles not a crushed cookie powder. Set the cookies to the side. 2. In a bowl you need to mix the all of the filling ingredients except the oreos. Once these ingredients are well mixed you will add in the oreos. You want to mix in the oreos just enough to distribute them through the filling. You want the filling for the main part to remain white with oreos in it. (I overmixed mine because I wasn't sure and my filling looks chocolatey. Tastewise it doesn't matter, but my filling ended up dark so in the pictures it is hard to tell filling from cake, if your filling remains mostly white you should be able to see it.) Put the filling in a pastry bag (I used a ziplock bag that I snipped one corner off of) and store in the fridge until we are ready for it. 3. Preheat the oven to 350. Spray your bundt pan with nonstick spray. Take your chocolate cake mix and add in the ingredients the box calls for (I used a Dark Chocolate Cake Mix, but any chocolate is fine). 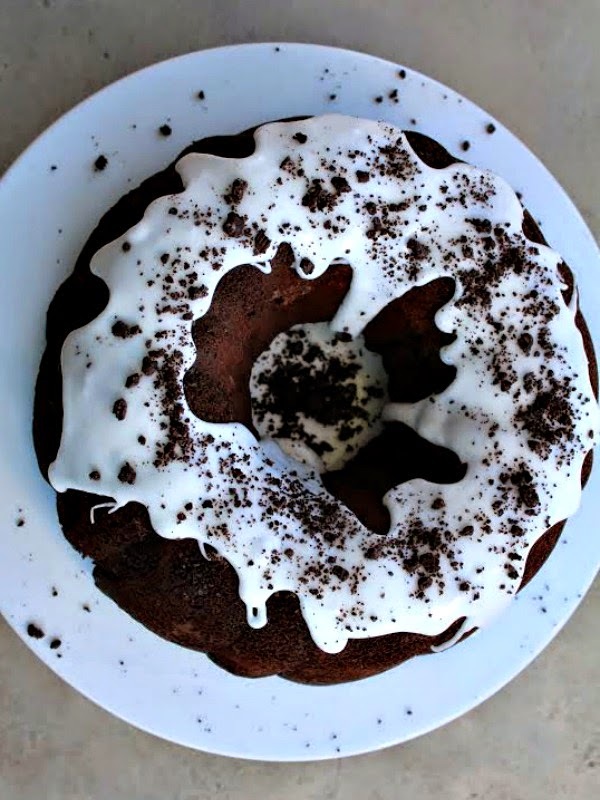 Pour half of your cake mix into the bundt pan, make sure you evenly pour it around the pan. Set the other half of the cake mix to the side. 4. Pull your filling out of the fridge, you want to distribute your filling into the bundt pan. Squeeze the filling around the bundt pan. Don't squeeze it all out in one spot, you need it to go all the way around. Pour the rest of the cake mix on top covering the filling. Pop it into the oven. This could take 35-50 minutes, depending on the cake mix you used. Mine took 40-45 minutes. 5. Remove from the oven. Leave cake in the bundt pan for a couple of minutes and then turn out onto a wire rack. Let the cake completely cool. Then move the cake to dish you want it on. 6. 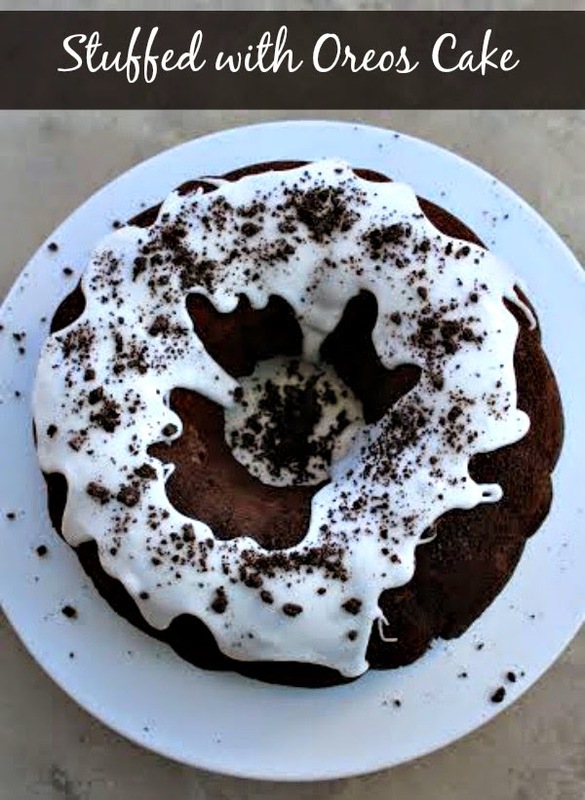 In a bowl you will whisk together the confectioners sugar and milk for the glaze. Start by only adding one tablespoon of the milk and add more as needed. You can keep adding a little sugar or milk at a time until the right consistency is reached. You want the glaze to be thin enough to pour over your cake but thick enough so that it won't all run off the cake. Then take that last oreo cookie that you finely crushed and sprinkle over the cake. Wow. That is an impressive looking cake! oh my goodness, you are a genius. this looks delicious! Wow, you just made me so hungry. That looks delicious! Enter our 3 for $30 giveaway including a Visa giftcard here!! !